Lucille was created because I really wanted to make something for me. At first I did not know what I wanted to do, but I wanted it to be fun and personal. I have seen some beautiful flowers and heart embroidery that I have been dying to try, but it just didn't feel like me. Then I thought of it, a lizard. I have a lizard tattoo, it is not cute and colourful like Lucille, but it is a part of me. You can read a goofy story I shared about lizards when I talked about this project here. Here she is on my embroidery hoop. I have two hoops at home, a little one and a large one, large it is. The fabric that she is on is the wrong side of a piece of denim. Here is the wrong side of her (on the right side of the fabric). Embroidery is new to me, I have only played a little bit with it, so when I read about keeping the back tidy here, I decided that was the only way I could do it. I love it. My three year old really likes to examine things and she kept checking the back as I worked on it, making sure it still looked nice! At the end of the project I also wound up all the left over threads on to these little card stock spools. I am proud of myself. 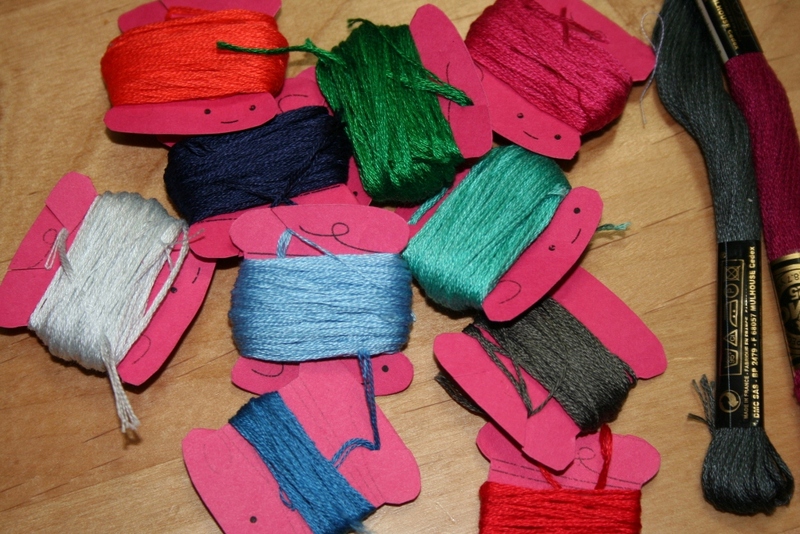 My other embroidery threads are in a bag in a tangled mess. My eight year old helped me with the organization. I added corner tabs on the back for hanging. The only stick(s) I could find at home were some very thin skewers. 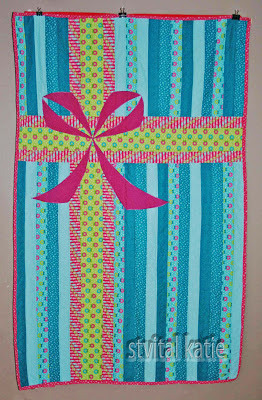 Even though this is a small mini quilt it was too heavy for one to hold it up without bending. So I took 3 of them, some purple duct tape and made a great purple stick. To quilt it I used monofilament thread. It was interesting. I don't think I would like it on a large project, but it was perfect for this mini. 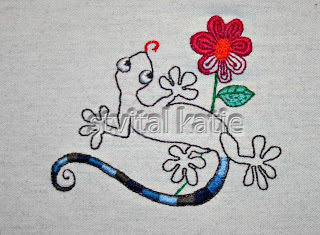 I chose a wind pattern and quilted around the lizard and the border. In the close up photo you can see her little pig nose. I love it. It make me smile, I also love the eyelashes, when I got to that part of the project I felt she really came to life for me. Where will she be hung? In my little sad cubicle at work. My office is lacking natural sunlight, grey (sad grey, not stylish grey), cluttered and dirty feeling. I need some items to cheer me up. I have not committed to where I will hang her. I will have to find a spot that I will get to see her while I work, you can see in the above a glimpse of what I am dealing with. 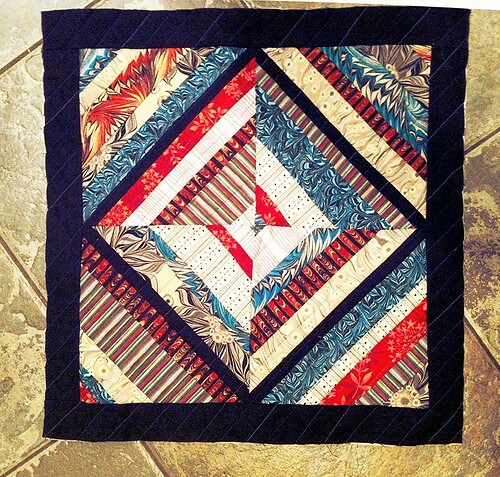 This was my first mini quilt. It was a lot of fun, I would love to do another one. I think this mini is approximately 10 inches square. Oh, one more thing, I have updated my favicon to match. Favicon: small graphic that is associated with a page or Web site. The favicon allows the Web developer to customize the site in the Web browser, both in the tab bar that is displayed in many browsers as well as in the bookmarks when a site is saved. I started writing this post with a whine! Good thing I read it before sending it off for all of you to read. In short, I don't have the best photography skills, but that is okay, because I still have fun sharing. 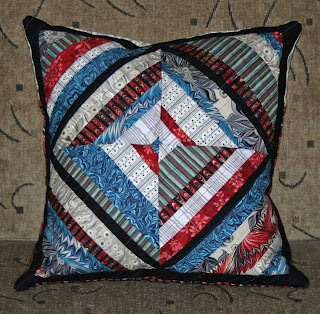 Today I am sharing a scrappy pillow that I made for my step sister and her husband. I shared the work-in-progress here. Any of you crafters know what it is like when you are looking around at all the lovely blogs out there, you see so many beautiful things, but some of them call to you and insist you make it sooner rather than later. 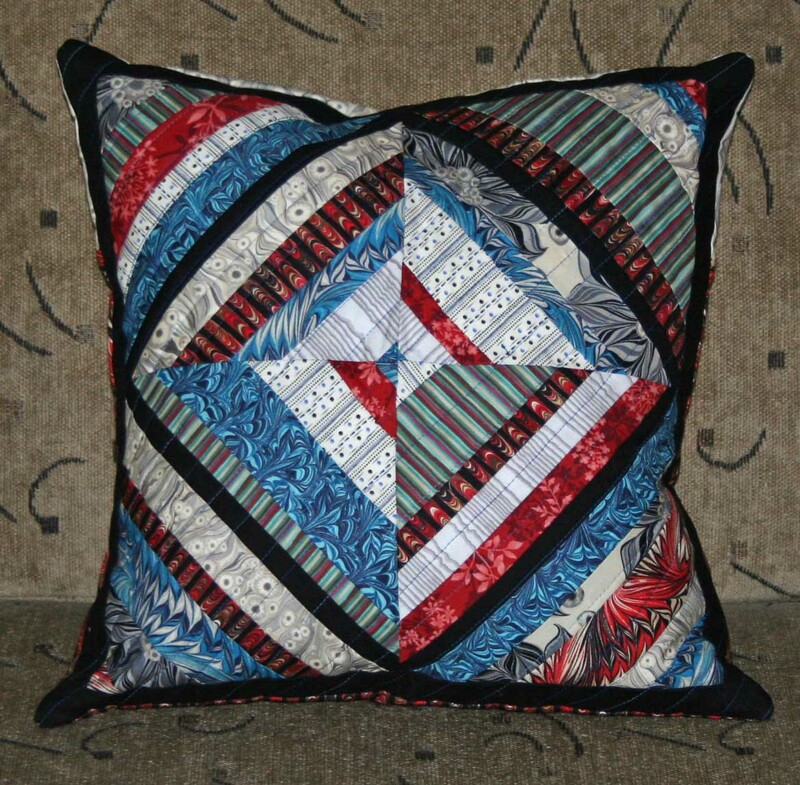 That is how I chose the string quilt pattern for this pillow. I loosely followed this tutorial. If you read my original post you will already know that I messed up. I cut 4 paper squares for the 4 quadrants, then pieced the fabric strings on two of them, however, when I put them together, there was a problem. The angles didn't match up! Apparently, in my excitement and rush to get going on a project, I had cut rectangles instead of squares. All four of them. How do you cut all four with the same mistake? I was able to correct the problem. I had to trim them to size on an angle in order to keep my centre black lines on the diagonal. It worked, the blocks were now smaller, but what I was looking for. I added the black border on the outside to make up the difference in size that I had lost. I quilted it with diagonal lines, you can see the quilting better in my in-progress photo below. Below is a photo of the inside. 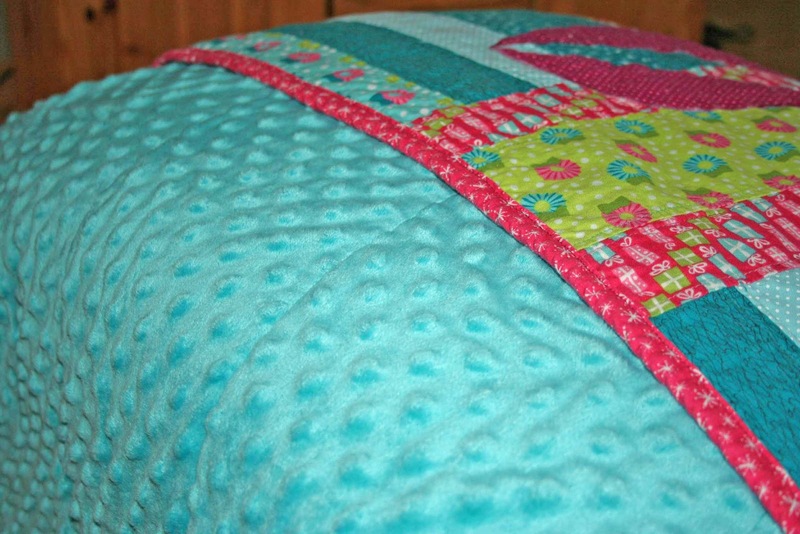 You can see the diagonal quilting and the finished edges. I love my serger, I am always so pleased when I have the opportunity to use it! I chose an envelope fold for the back, my original plan was to add a zipper closure, but time was of the essence and I have plenty of pillows with the folds, so I chose that. 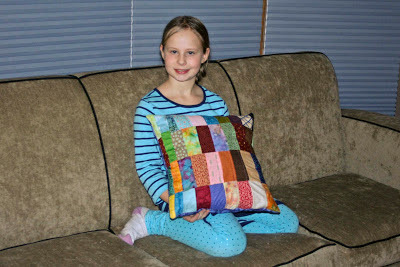 I did make one more pillow as a gift this year. I made it for my Step Mother. It has a Christmas theme to it, although I am sure you could use it at any time of the year. My Step Mother's Christmas decor is the opposite of mine. It is very polished and beautiful. When I found the gold fabric I was sure it would work in her home. The green trim seemed the perfect compliment to finish the pillow. I didn't capture the true color of the fabric very well, I would say it is somewhere between the two photos, likely a little closer to the close up photo. I am very happy that I changed my mind about handmade gifts this year. Sometimes they are worth it! I picked up my Mom's sewing machine at the end of last week, she is letting me borrow it while mine is being fixed (again). I was so excited to get it, but then my motivation disappeared, I didn't want to sew. Until my over the top dog bed caught my attention. Why did my dog bed need mending? Two reasons: 1. A very poor choice of fabric for the bottom, and 2. My dog loves his bed too much and wrestles with it, resulting in holes. In the before shot you can see the bottom, full of lint and threads that were collected off my floor and nearly impossible to remove from the fabric, and one of the many holes on the top of the bed. In the after shot you can see I replaced the bottom with a denim fabric (which my dog has already put a hole in, grrr) and I appliqued patches on the holes. I added 8 patches, one of which ran the entire length of the dog bed. The sewing didn't take as long as unpicking all the stitches including the zipper. After the dog bed I was feeling pretty good about my productivity and decided it was time to fix a beloved blanky that lives in our house. I made the blanket 6 years ago, it was the first blanket I ever made and I struggled with it. 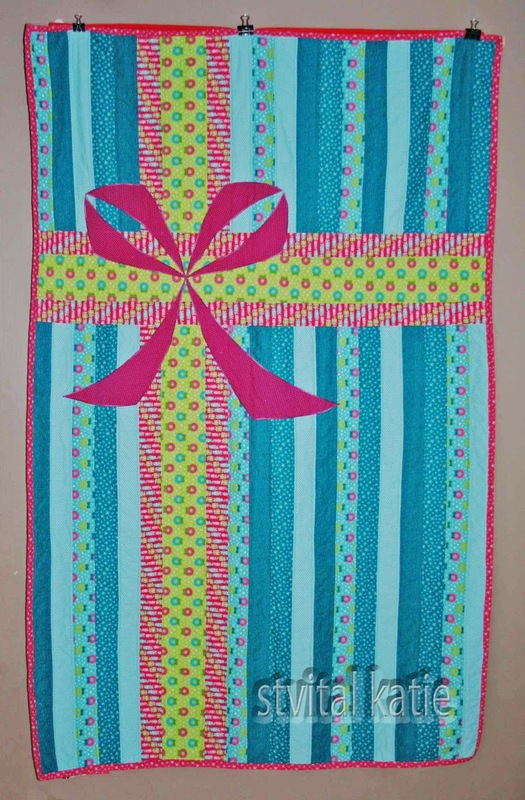 It was made with a fabric panel, layered with batting and a backing. I fought trying to quilt them together without puckers on the back, in the end the blanket was a LOT smaller than it should have been because I cut so much off and I still had issues, some of my poor sewing in the beginning made it more difficult to repair than it should have been. The picture you see below is not the original fabric. The original panel wore completely off. The top half and bear was replaced a year or so ago. This time I had to fix the bottom, what you see in the picture is the batting! I spent 1 1/2 hours unpicking quilting and removing the binding, then added some motorcycle fabric (a special request). It is not the fanciest blanket, but it is dearly loved and its owner is very happy with the results. LIZARD! I have named her Lucille and she is almost done. I just need to hand stitch the binding. I should have a full post about her soon. Lastly, my yarn order came in! I am so excited and could not help but start on one of my projects right away. Do you see those lovely knitting needles? The project is an entrelac neck warmer, so it is a little wonky right now. I am happy with how it is coming out so far, much better than the hat I hat to rip apart a few weeks ago.